The idea for AISN originated with two USAID employees who wanted to bring their children to Nouakchott, and were eager to have an American school for them to attend. Mrs. Mary Grayzel, Founder of AISN, envisioned that as a small school, AISN could provide personalized education to each student. This concept was supported and encouraged by U.S. Ambassador Gregory Kryza and Robert Klein, USAID Director. There was a realization that the existence of a school also encouraged State Department employees to bring their families to Nouakchott. Indeed, the family orientation of the post and the sense of community generated strength for this new school in the Sahara Desert. 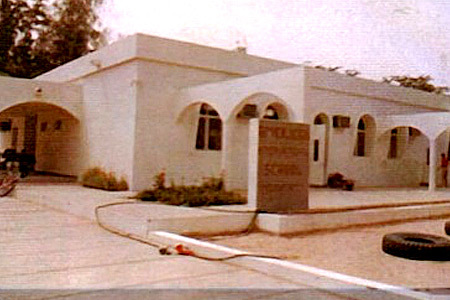 The founding of the school in 1978 was very much an effort of the American and international community. The school was initially in one wing of the Grayzel Family house. There were only two classrooms and an atrium with a garden. Initially, instruction was provided through the Calvert Correspondence course. Later, a German architect working in Nouakchott agreed to do the preliminary plans for the school and eventually, Dan Dunham, architecture professor at Columbia University, took on the project of designing the extension. As the school grew, teachers and additional grades were added. New classrooms were builtto accommodate the growing elementary-aged student body. Eventually, the school began offering a middle school program, as well as a high school online program through the University of Nebraska On-Line High School. After careful consideration, the decision was made in 2008-2009, thirty years after the opening of the school, to add high school classes and teachers. In June of 2011, AISN had its first true graduate. Since then there have been a total of 18 high school graduates from our school, many who have gone on to attend universities and colleges in America, Europe, and the Middle East. AISN continues to be a prominent educational institution with academic, social, and co-curricular programs that strive to prepare our students for success in all aspects of life, long after they have left Mauritania. Our history will continue to write itself with each student, teacher, director, and parent who becomes a part of our family, leaving their own mark on the legacy of our school. AISN offers an accredited American International education committed to excellence, achieved in partnership with the AISN community to prepare our students for admission to universities worldwide, transfer to other American/International Schools, and to public or private schools in the USA.